In SELinux, all access must be explicitly granted. SELinux allows no access by default, regardless of the Linux user/group IDs. Yes, this means that there is no default superuser in SELinux, unlike root in standard Linux. The purpose of this rule is to give the passwd process' domain type (passwd_t) the access to the shadow's file type (shadow_t) needed to allow the process to move and create a new shadow password file. What this rule does is allow Joe's shell (user_t) to initiate an execve() system call on the passwd executable file (passwd_exec_t). The SELinux execute file permission is essentially the same permission as x access for files in standard Linux. This rule provides entrypoint access to the passwd_t domain. The entrypoint permission is a rather valuable permission in SELinux. What this permission does is define which executable files (and therefore which programs) may "enter" a domain. This is the first allow rule we have seen that did not provide access to file objects. In this case, the object class is process, meaning the object class representing processes. Recall that all system resources are encapsulated in an object class. The process' new domain type has enTRypoint access to an executable file type. The process' current (or old) domain type has execute access to the entry point file type. The process' current domain type has transition access to the new domain type. When all three of these permissions are permitted in a TE policy, a domain transition may occur. Further, with the use of the entrypoint permission on executable files, we have the power to strictly control which programs can run with a given domain type. The execve() system call is the only way to change a domain type, giving the policy writer great control over an individual program's access to privilege, regardless of the user who may be invoking the program. To support domain transitions occurring by default (as we want in the case of the password program), we need to introduce a new rule, the type transition rule (type_transition). This rule provides a means for the SELinux policy to specify default transitions that should be attempted if an explicit transition was not requested. Type_transition rules are used for multiple different purposes relating to default type changes. The type_transition rule indicates that, by default on an execve() system call, if the calling process' domain type is user_t and the executable file's type is passwd_exec_t , a domain transition to a new domain type (passwd_t) will be attempted. The type_transition rule allows the policy writer to cause default domain transitions to be initiated without explicit user input. This makes type enforcement less obtrusive to the user. The RBAC feature of SELinux is built upon type enforcement; access control in SELinux is primarily via type enforcement. Roles limit the types to which a process may transition based on the role identifier in the process' security context. Role-based access control (RBAC) is a general security model that simplifies administration by assigning roles to users and then assigning permissions to those roles. 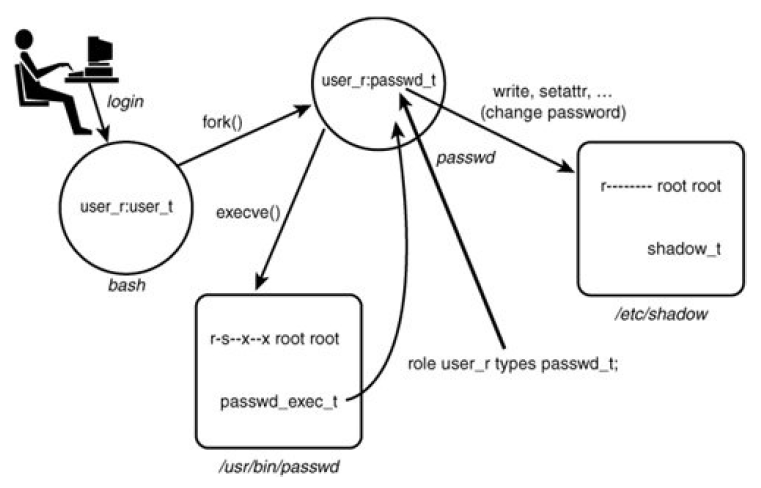 RBAC in Security-Enhanced Linux (SELinux) acts as a layer of abstraction between the user and the underlying type-enforcement (TE) model, which provides highly granular access control but is not geared for ease of management. Notice that the MLS security context must have at least one security level (which is composed of a single sensitivity and zero or more categories), but can include two security levels. These two security levels are called low (or current for processes) and high (or clearance for processes), respectively. If the high security level is missing, it is considered to be the same value as the low (the most common situation). In the policy server architecture, all manipulation and management of the overall system policy is controlled through the policy management server (PMS). 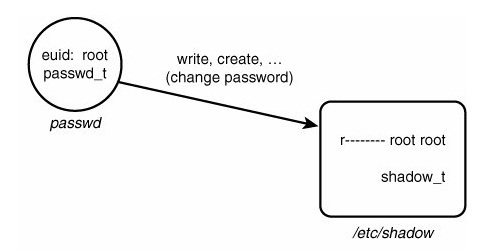 The PMS is itself a userspace object manager in that it creates object classes representing policy resources and enforces a fine-grained access control policy over those resources. With the PMS, you can now allow access to portions of the policy and limit access to others. For example, the SELinux policy can allow user management tools to add users and make role assignments, but not change type enforcement allow rules. Better yet, you can authorize a database server to change type enforcement (TE) rules relating to its object classes and types, but not those of the kernel. Internally, the PMS is designed to use another recent new feature of SELinux, loadable policy modules. The second major function of the PMS is to split the system policy into kernel and user portions and load them respectively into the kernel security server and userspace security server (USSS). In this way, the kernel is not made aware of rules and object classes of concern only to userspace object managers. Userspace object managers query the USSS and not the kernel. AVCs in various userspace object managers register with the USSS (and not the kernel) for policy update and cache coherency functions. The first section of a policy source file defines the object classes to the security server. This section also defines the permissions for each object class. For the kernel, these classes are directly related to kernel source files. In general, as an SELinux policy writer you would never change or modify the object class and permission definitions. The next section contains the type enforcement statements, which is by far the largest portion of an SELinux policy. This is the section that policy writers spend most of their time writing. It contains all the type declarations and all the TE rules (including all allow, type_transition, and other TE rules). The next section of a policy source file contains the constraints. Constraints provide a means of further limiting the TE policy beyond what the TE rules permit. 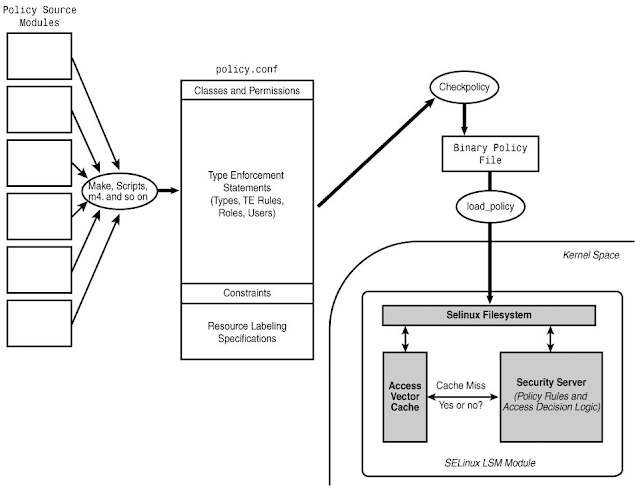 The multilevel security (MLS) policy, for example, is implemented as a set of constraints. The last section of a policy file contains labeling specifications. 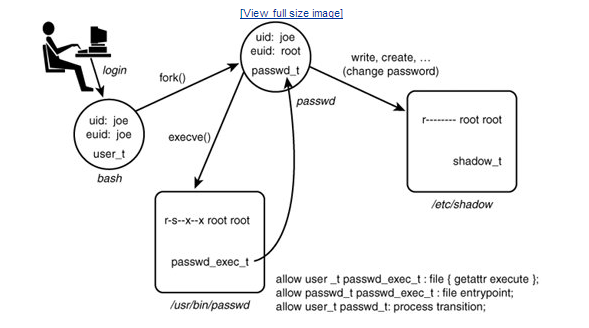 All objects must be labeled with a security context for SELinux to enforce access control. 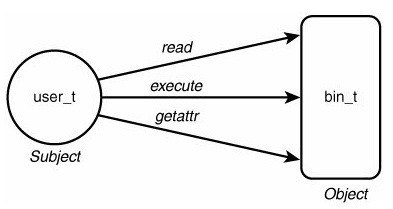 This section tells SELinux how to treat filesystems for the purpose of labeling and contains the rules for labeling transient objects that are created at runtime. A separate related mechanism, called a file contexts file, is used to initialize the security context labeling of files, directories, and other objects on permanent filesystems. Above figure shows a typical way that a policy is constructed. Starting from the left side of this figure, you have the source files for the policy broken down into many tens of individual source modules. Compile the source policy using checkpolicy into a binary policy file, load_policy program is then used to load the binary policy file into the kernel, which then enforces access control based on the policy rules. Make policy.conf and policy. [ver] locally to test the compilation and check for error. Do everything that make policy does plus install the binary policy file such that it will be loaded into the kernel at boot time and the policy configuration files. Do everything that make policy does plus immediately load the binary policy file into the kernel as the active access control policy and install the file_contexts file. SELinux is implemented as an LSM module in the kernel. 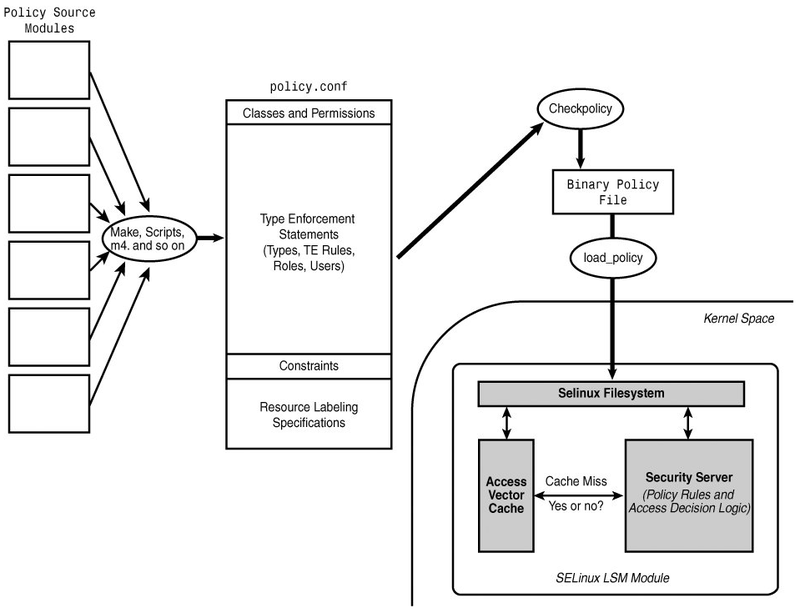 SELinux uses LSM hooks throughout the kernel to control access to kernel resources. Access decisions are made by the SELinux security server, which is part of the SELinux LSM module. The security policy enforced by the security server is loaded into the kernel via a privileged userspace interface. The AVC provides performance improvement for access validation. 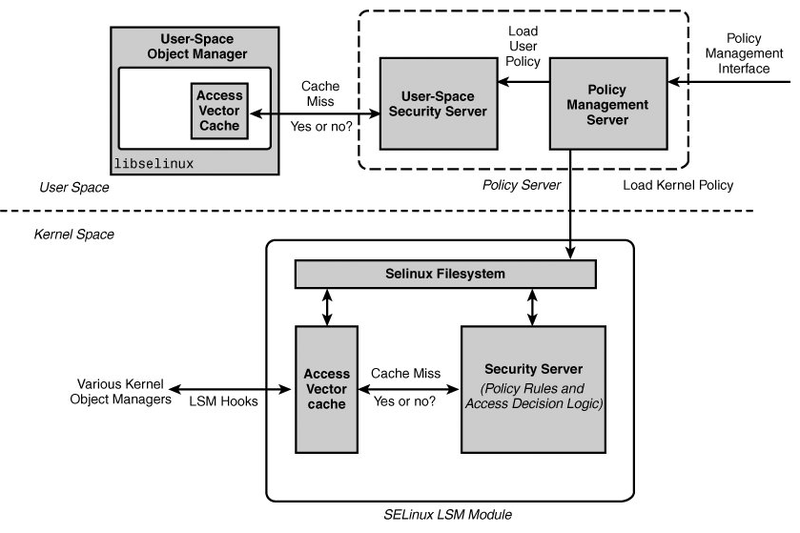 The SELinux framework also supports userspace object managers through the libselinux library. In its basic form, the kernel security server directly provides access validation, whereas the library contains a per-process AVC. This approach requires the kernel to hold the policy for all userspace managers and to be aware of all userspace object classes. The emerging policy server architecture enhances support for userspace object managers by providing a userspace security server that will enforce all portions of the policy relating to userspace objects, thereby relieving the kernel of its need to know of userspace object classes and policy rules. The policy server will also provide fine-grained access control to the policy itself, allowing greater distribution of policy management authority.